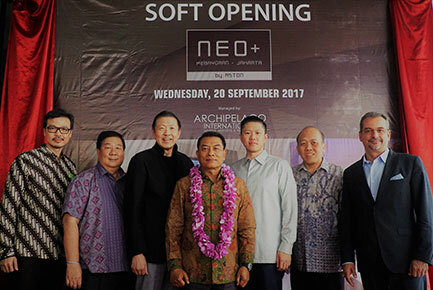 Jakarta, September 2017 - Archipelago International, Indonesia's largest hotel management company, continues the rapid expansion of its hip yet affordable Hotel NEO label with the opening of the Hotel NEO Kebayoran. Becoming the first Hotel NEO in the capital city, the new Hotel NEO Kebayoran joins Archipelago International's impressive collection of 24 hotels in Jakarta alone out of 130 across South East Asia. With easy access to tollway, Hotel NEO Kebayoran will cater to business and leisure travelers who will also be in convenient proximity to the Jakarta’s Sudirman Central Business District (SCBD) and nearby malls. 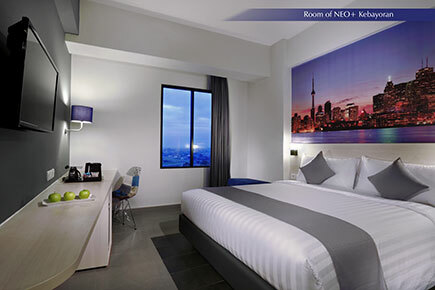 Spread across 17 floors, Hotel NEO Kebayoran boasts 102 stylish rooms, each of which feature a host of amenities, including LED TVs with international & local channels, workstations with universal outlets, a mini fridge, tea & coffee makers and ensuite bathrooms with complimentary toiletries. Outside of the guestrooms, the hotel features a number of state-of-the-art leisure facilities, including a restaurant, a lounge and bar, a rooftop swimming pool overlooking the Jakarta skyline, and high-speed complimentary Wi-Fi. With 4 meeting rooms, the hotel promises to be an excellent destination for corporate and social functions in South Jakarta area. "Archipelago International does realize that affordable accommodations with complete modern facilities are on high demand in Jakarta, especially for people travelling for business. The hotel sits just meters from the Kebayoran station in midst of a burgeoning area with easy access to both, central and south Jakarta and aims to offer the very best value for money in the area. We are confident that this newest NEO will be well received and join the other already popular Jakarta NEOs in Tendean, Melawai and Mangga Dua." said Norbert Vas, Vice President of Business Development for Archipelago International. First introduced in February 2011, with the slogan "Try Something Neo", Hotel NEO quickly made its mark on Indonesia's hotel landscape with it's modern-contemporary design and amenities geared to the needs of business travelers. Currently there are 19 Hotel NEOs in the portfolio, with plans to open more in Malang, Surabaya and Jakarta. By the end of 2019, Archipelago International will open more than 20 new hotels under various brands across the region. Enjoy the most comfortable staying experience only in Hotel NEO Kebayoran. Get 10% discount by using BOOKDIRECT promotion code on the website. Download the Archipelago Membership App to get more special promotions in all Archipelago International hotels across South East Asia.